When did you join Comtrade and what is your current role? I joined Comtrade in August 2016 and I currently work as Android Developer. What’s the best part about working at Comtrade? You don’t really understand how a real business environment works until you start your first job. As a university student, you gain theoretical knowledge but the lack of practical experience leaves you unprepared for the real world. 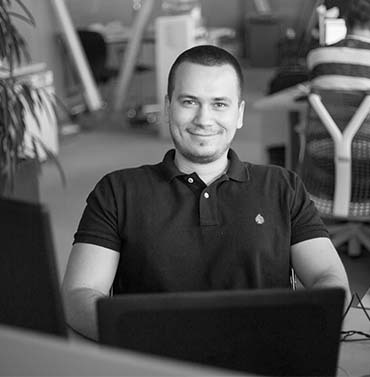 At Comtrade, I had the opportunity to take part in real projects and work in teams with people of different backgrounds. It was my first taste of workplace life. Why did you apply for EDIT? I discovered EDIT via the edit.world website, where I looked up all necessary information and submitted my application. I decided to apply because I wanted to get a glimpse into what it’s like to solve real business challenges. What was your experience at EDIT like? What project did you work on? My team and I worked on developing an Android application, which was great because it involved the skills and expertise I was eager to develop. Our project was centered on augmented reality and encompassed teamwork, plenty of challenges and knowledge transfer, all of which I found extremely useful. What is your favorite memory from EDIT? How did EDIT help prepare you for a career in IT? EDIT was a great learning curve. At university, you don’t get much exposure to the real-life business environment. That’s why practical experience is extremely valuable – it gives you a unique insight into the professional workplace. How do you see your future at Comtrade? I’d like to continue working as Android developer, constantly honing new skills and pursuing further career growth. I believe every programmer aims to become a recognized expert in his field. That’s exactly my goal – gain as much experience as I can, work on as many projects as possible and expand my network of contacts. I see Comtrade as an excellent career development platform that will enable me to accomplish these goals.